EDIT: And we’re back. Changed all links to fav site, Massively. So much Guild Wars news today, but first I will start with the unexpected bomb so I can spend more time working on a post for the Guild Wars update later today. It seems that Massively received a pretty good demo at GDC, where they filmed it entirely. We know about the first part being the norn starting area, which was expected for the new demo coming out. And then at Massively’s demo the presenter casually drops that “oh yeah, the sixth profession is the thief. Play it.” I have to say I was not expecting another profession reveal before PAX, and I definitely was not expecting it in the updated demo/presentation. So the Thief. A little more fantasy core than the Guild Wars assassin, and slightly less misspelled than the rogue (you know, than the theif). 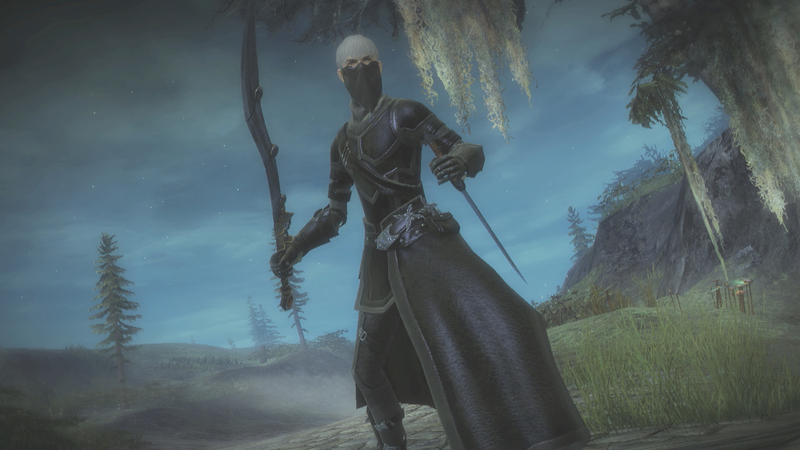 This profession appears to take it’s ancestry directly from the old assassin as the thief profession keeps dual-wielding light weapons, like daggers and pistols, as main attack tools. The thief also retains high mobility in the form of shadow-steps and what-to-looks-to-be very long range rolls. Finally, the thief gains a controversial stealth ability. Stealth will have a duration, and it is unknown how it will affect PvP. Finally, true to it’s name the thief can steal items from enemies and use those weapons against the foe. For example, the thief can steal some feathers from a moa and then fling the feathers back into the moa’s face for great blindness. I like that the thief is the follow-up to the guardian profession. Both professions seem to rely more heavily on battlefield positioning and awareness than the base four. Whereas the guardian seeks to control large pieces of the battlefield, the thief has to slip into the cracks and be able to slip back out. The new demo shows that the game has been through many iterations. The stats have been distilled down to four from the original six, a wurm-like necromancer minion, and more! I think that between the playable thief, playable guardian, new zones, and new mechanics there will be tons to talk about after PAX East! Can’t wait to get home so I can see all of this – stupid work computers and their restrictive firewalls! Its going to be a very fun few days on GW. REALLY glad I booked Monday off work! Ravious, do u notice there seems to be a disconnection between video 3 and video 4? Makes me wonder if there’re more to the demo? Yeah, there was a hiccup in video 3 I think to right after the initial moa fight. I figure they were just trying to coordinate activity with the demo players back at home base. Aww… okie. I figured. Owells…. was kinda hoping for more .. Looking good! This definitely throws a wrench somewhat into which races and classes I’ll be playing at first. I was going to try and stick to a single character and leave the alts until later, but I’ll probably break down and start rolling alts sooner than planned. Bet there will be a lot of Asuran Thief Dual Pistol characters; at least I’m thinking of having one. > You have 10 pips of initiative. > The 1st weapon skill costs no pips, but subsequent ones can cost a few or a whole lot. > You can use initiative any way you please so, for instance, if you’re behind a foe you could expend 9 pips on 3 Backstabs at 3 pips apiece. > Initiative recharges rapidly (it happens with time you don’t have to spam your 1st skill as a builder or anything), but until you have the pips to afford a skill you cannot use it. There are no cooldowns – normal or punitive – but initiative pips function like a collective system of recharge units. So if you have no pips and desire to use a 6 pip skill, you have to wait 6 units of recharge. If you get impatient and use a 3 pip skill after 3 units of recharge, you’re 6 untis of recharge away from your 6 pip skill again. The power is in your hands; you can use your most powerful skill every 1-12 second swith nothing but light attacks in between, or fight for minutes without ever amassing the pips to use it once! Thanks for the clarification, Vulturion. It was a little hard to understand with the brief description they gave in the video. This sounds exactly like adrenaline in GW1. If so, it seems odd that they gave this mechanic to the thief instead of the warrior. Is there any significant difference? “So if you have no pips and desire to use a 6 pip skill, you have to wait 6 units of recharge. All of the above could be said of adrenaline without a word of change. I presume you’re an ArenaNet employee with access to information the rest of us don’t have, so I’ll reserve judgement until we get more official details, but if there are any actual functional differences that would affect a player’s tactics, I can’t see them in what you’ve given us so far. The only detail that might be significant is starting with max initiative instead of zero, which gives thieves a powerful alpha strike (cue the usual balancing issues other MMOs have seen in similar classes), but that’s just a one-time thing. Sorry, I don’t want to sound like I’m just being contrary here; I really don’t understand what these big differences are that you’re seeing. GW1 adrenaline required you to be getting hit or hitting enemies to fill adrenaline. GW2 initiative fills with time and at least one skill we know of adds initiative. This is a HUGE difference that changes combat DRASTICALLY. Where a warrior wanted to be getting hit and having a monk keeping him from taking much damage, a thief will want to spend the majority of his time avoiding attacks to give his initiative a chance to regenerate. If you’re a GW1 warrior with no adrenaline, you want to go into you-wack-me-i-wack-you combat because you build adrenaline for your better attacks. If you’re a GW2 thief, you want to avoid trading blows when you’re low because your basic attack is weaker and you can’t use anything else until you buy some time. So this is a custom combo you can do that can be improvised on as much as you want. As you learn the class you’ll learn the timing for what you can and can’t do because the ENTIRE resource mechanic is only a function of static time and timing of abilities. If you can do a combo from 10 pips once, you can do always do it because it wasn’t based on you getting enough hits in or being hit enough. I don’t work for Anet, and I highly doubt vulturion does, as everything he posted is available from the previews, but it’s pretty obvious to me that even though it has some similarities, initiative is very different from GW1 adrenaline, and honestly works more like GW1 energy than anything else. Just adding on to my previous statements, I see the whole “combo” idea as being a major learning curve and also the best way to personalize your thief. Over time, you’ll be able to quickly look, say “I have 7 adrenaline, I’m at distance, and against a melee fighter” and you’ll no exactly what combo to pull off that only costs 7pips +however many seconds it takes to pull off. If you have 10 and you’re against a person who prefers range, you’ll know exactly what to do to close the distance and cripple while leaving yourself pips do to it again if they escape. I’m already in love with this mechanic and I haven’t even seen it used well yet (I mean by a player with a deep knowledge of timing and cost of all his skills). They changed the attributes? From what we know that will have rippling effects on other things. Our boy Shawn looked alot like what most MMO players are probably going to look like their first “hands-on” with the game… slow – and completely FAILing to grasp the concept of needing to constantly be moving while still performing actions all at once… not one or the other. Personally, I’m really looking forward to the new dynamic play-style, and I think this next look at the game we’re going to be getting at PAX East is only going to make me more anxious for my own first, tentative steps into a bold new paradigm. We’ll see, I’m not making any definitive judgements until we know what a bunch of the specific skills do. There are no alpha strikes – no moves at all with special “from stealth effects” thus far, and we’ve seen all the dagger ones. Hold on – so have the officially revealed it now? As in on the GW2 site? Not fully because they weren’t ready. The leak forced them to reveal it piece meal this way.